Join our bicycle maintenance class on the first Monday of each month at 6.30 pm. Bring your own bike and an agenda of what you want to learn. Our tutor, Julian Stephenson, who is Shimano and CABDA certified, will show you how to do it. 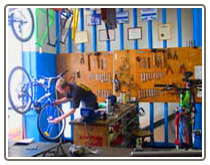 The course is held at Adventure Cycles Shop.